If you’ve been waiting to dust off your lederhosen for Oktoberfest, here’s a little secret: the best time to hit the beer garden is in September, after the swelter of summer has started to die away and before all the crowds arrive to get their German on as October approaches. There’s something almost perfect about spending an early fall evening passing a boot of pilsner while the accordionist whips everyone into a frenzy with a stirring rendition of “Ein Prosit.” D.C. boasts several biergartens now, from traditional to trendy, so here’s a sampling and what you can expect in terms of both beer and pretzels. DACHA Beer Garden: 1600 7th Street, N.W. Named after the Russian term for “summer house,” DACHA is a seasonal beer garden a block from the Shaw Metro station, open from spring through fall each year. Singles mingle under the watchful violet-eyed gaze of a huge mural of Elizabeth Taylor painted on the brick wall that forms one side of the beer garden, and dogs are welcome to accompany their owners and plop under the benches for a snooze. You can get some grilled brats and veggies here, but it’s also OK to bring your own food; be warned that they will check bags on the way out, just to make sure patrons didn’t snag a souvenir biersteifel to bring home. Beer: In addition to several good beers, both American and German, including a luscious raspberry-spiked rubaeus, DACHA also offers mead, cider and gluten-free beer. Pretzels: The pretzels are decent, but the tangy beer cheese dip is the star. Biergarten Haus: 1355 H Street, N.E. 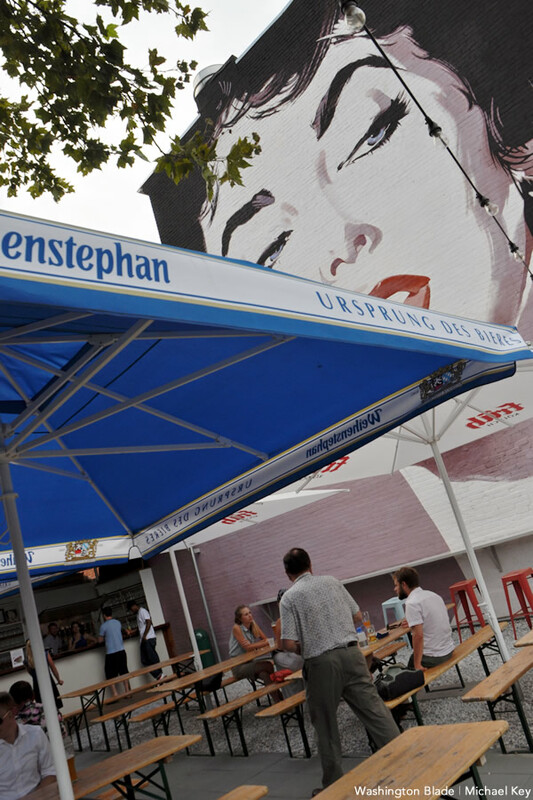 One of the earlier examples of the beer garden revival in D.C. is Biergarten Haus, which opened in 2010 on the upper end of the uber-hip H Street corridor — sometimes called Epcot by the locals because of the globally themed restaurants that have sprung up there in recent years. Modeled after beer gardens found in southern Germany, Biergarten Haus boasts a large courtyard area with long wooden tables and benches that are actually comfortable for sitting on for long periods of time (they have backs, so you can actually lean back and relax while you hoist another stein or two). There’s also plenty of spaetzel, wurst and schnitzel — and, yes, even live polka music on occasion. Beer: You can get a beer sampler of all 13 draft beers, 2 ounces each, for $45. Pretzels: Biergarten Haus offers freshly baked Bavarian pretzel rolls with both mustard and cheese sauce for dipping. Cafe Berlin: 322 Massachusetts Ave., N.E. 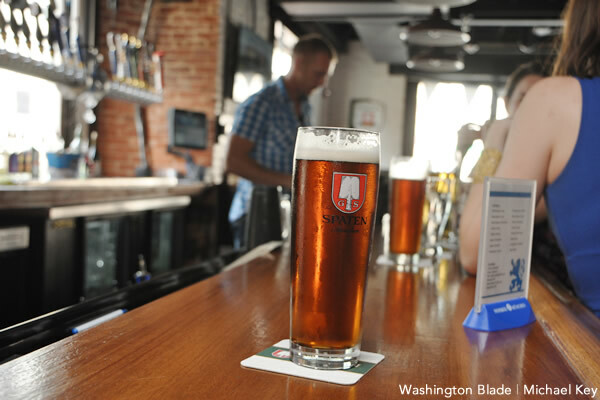 A favorite haunt of homesick German Embassy employees, Cafe Berlin has provided an authentic taste of Deutschland for 30 years just a few blocks from Union Station on Capitol Hill. The charmingly secluded patio in front of the restaurant serves as a perfect date-night biergarten, the kind of place where you clasp hands across the table over elegant plates of sauerbraten and potato pancakes. It’s easy to imagine that you are, in fact, eating al fresco in Berlin — kind of a staycation in a stein. Beer: In addition to traditional German beers, Cafe Berlin also offers several good German wines and even a couple of tasty cocktails featuring pilsner with St. Germain liqueur and gin with lingonberry jam. Pretzels: The house-made pretzels are pillowy perfection, presented on a wooden cutting board shaped like Germany and accompanied by a caraway-studded beer cheese spread sprinkled liberally with chopped red onion. Sauf Haus: 1216 18th Street, N.W. 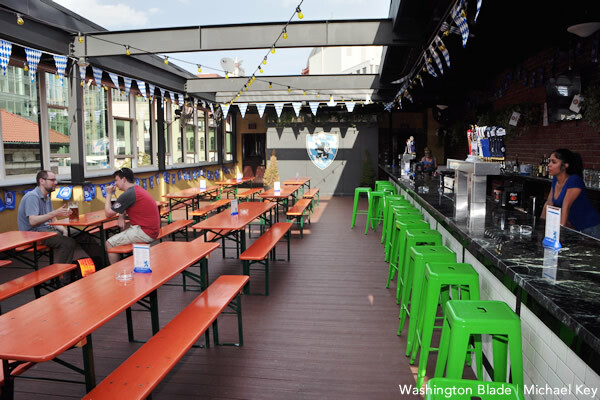 Overlooking downtown Connecticut Avenue, Sauf Haus boasts a rooftop deck open to the evening sky, making it a popular happy hour spot for young office workers searching for a view and a game of foosball. If you feel the floor shaking beneath you, it’s likely not the effects of too much beer, but because of the air conditioning system that appears to be housed beneath the deck. Like DACHA, Sauf Haus doesn’t boast much of a menu, focusing mostly on a wide selection of Bavarian beers. When the weather turns cold, they plan on tenting the roof for year-round use. Beer: If you really like to drink from a boot, you can order the two-liter one for $35 — and you get to keep the boot. Pretzels: It’s not a joke — Sauf Haus has a two-pound pretzel as big as your head that will easily feed a table of four.